The Quiet and Portable Electric Breast Pump Prolactis. The Lovi electric breast pump, Prolactis has two phase breastmilk expression; massage or stimulation and expression. The Gentle massage and stimulation ensures painless breast milk expression. The massage stimulates your breast for milk let down without much effort. There are five medically calibrated power levels to adjust the pump to your needs. Calibration is important so unregulated suction power does not hurt breast tissue. In an electric breast pump following the correct rhythm (active suckling reflex), the funnel shape and size are more important than the suction power of a breast pump in emptying breast milk. Correct funnel size with massaging cushion helps maximum milk expression. In medical studies in Polish hospitals, it has been established that LOVI breast pump is the correct solution in combining pumping and long term breast feeding. Converts into lighter, portable manual breast pump. Works in two phases- stimulation and expression. Free spare parts and breast pads (10) in the pack. 1x electric breast pump prolactis, 1x parts for manual pump, 1x 150 ml milk storage bottle ( can be used to feed a baby with teat, teat not included), 1x soft sealing disc, 1x cup with scale, 1x AC adapter, 1x padded carry case, 1 x spare parts, 1 x breastfeeding guide/manual. Explore the entire range of Breast Pumps available on Nykaa. 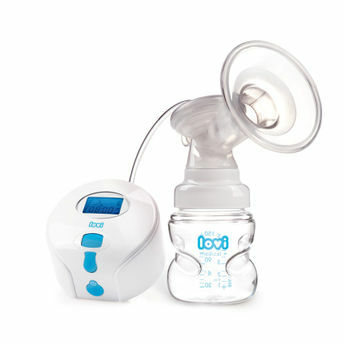 Shop more Lovi products here.You can browse through the complete world of Lovi Breast Pumps .